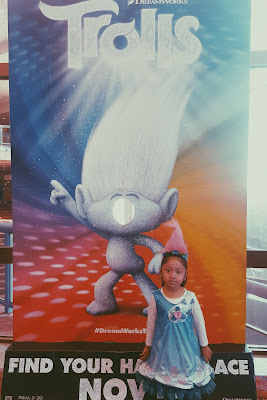 I was able to attend a free advanced screening for Dreamworks Trolls Movie. All opinions are my own. My dear Dynamo did not make it to the playoffs so I do have a little more time on my hands. I was invited to preview the Trolls Movie with my little Zoë she loved the movie so much we had to change the theme of her birthday party!!! The visuals throughout the whole movie keep you in awe. The colors are amazing. We watched it in 3d and I tell you it's a must you feel like you are there having a party with Poppy (main character). The storyline is very positive and easy to understand Zoë just turned 5 and was relatable to her. I has an adult had a good laugh and resisted the urge to get up and dance!! I liked it. It was awesome. It was fun I want to see it again. We will definetly see it again in theatres. will you be going? From the creators of Shrek comes DreamWorks Animation's Trolls, a smart, funny, and irreverent comedy about the search for happiness, and just how far some will go to get it. 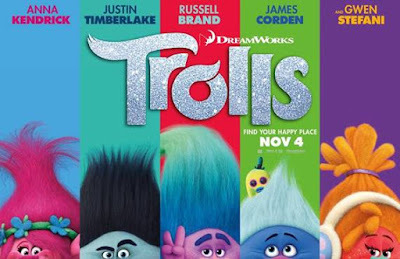 This hilarious film transports audiences to a colorful, wondrous world populated by the overly optimistic Trolls, with a constant dance in their step and a song on their lips, and the comically pessimistic Bergens, who are only happy when they have trolls in their stomachs. After the Bergens invade Troll Village, Poppy (Kendrick), the happiest Troll ever born, and the overly-cautious curmudgeonly Branch (Timberlake) set off on a journey to rescue her friends. Together, this mismatched duo embark on a rescue mission full of adventure and mishaps - trying to tolerate each other long enough to get the job done. Utilizing music to further the film's narrative, the Trolls soundtrack is produced by Justin Timberlake and features five original songs including songs by Justin Timberlake and Gwen Stefani in addition to a number of classic hits from the 60's - 80's. 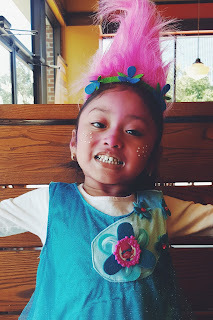 She looks so cute with her Trolls hair do!